Discussion in 'Guitars in General' started by calfzilla, May 7, 2016. I was talking to a DFW tech while he checked out a CG I got off of Reverb and started chatting about Strat wirings... He mentioned he had figured out a way to wire a volume with a hi-cut and low-cut in place of the standard V-T-T. Does anyone know what this wiring would look like layout wise? 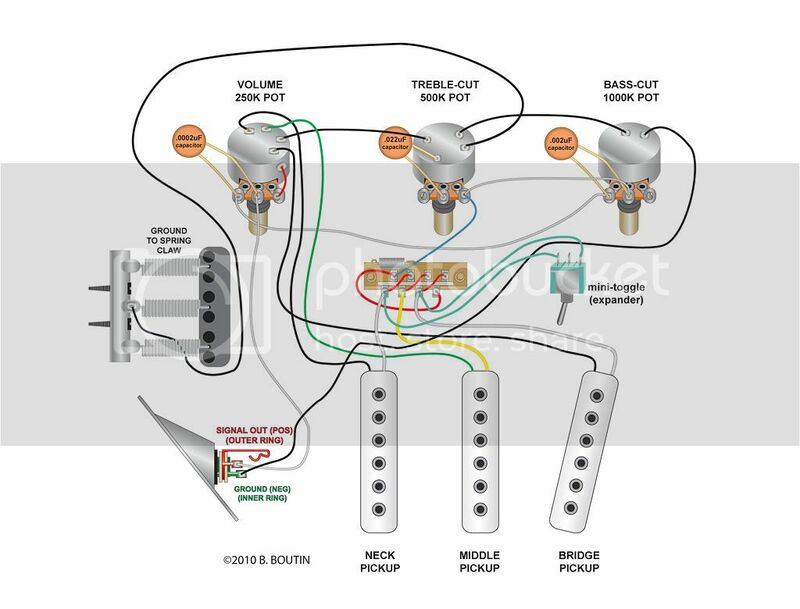 I've got a set of pickups I want to drop into my Strat but I've been waiting until I found a wiring scheme that made sense. The Fender TBX control does this on on pot. Split into 2 pots I'd maybe take a look at a regular tone pot paired with the bass cut which is used in a lot of Reverand guitars. Fender is doing some crazy stuff these days. What's up with the personality modules? What you're looking for is called PTB wiring "passive treble-bass", it's worth trying out to see if you like it. You can do the same thing as G&L is doing by adding a .002 cap to the 1M side of the TBX, and adding a 220K resistor in place of the one that ships with the TBX pot (which was used with the active mid-boost). You get the same functionality in one pot vs two is all. One of the many reasons I love my G&L. It's very useful to cut out just a little bit of high end, those single coils can be a bit sharp at times. It wouldn't be the same, though, would it? How could you (1) turn the bass up, AND turn the treble up, or adjust them independently of each other? These controls are passive so you're never turning anything up, you're turning the treble or bass down only. You're right, not identical, though I said the same functionality as in you can either remove treble or remove bass with the modified TBX, which is how these things are generally used (lower bass on neck pup and lower treble on bridge pup etc). With the G&L you can remove bass and treble at the same time, but if you do you won't have much signal left, so I don't know how useful it would be aside from being a special effect? Do you have a G&L, and if yes do you remove bass and treble regularly (just curious)? MFD pickups have a broader timbre than regular Strat style pickups, so a bass cut is a good idea. What is DFW, and what is a CG? .....What is DFW, and what is a CG? The G&L passive bass and treble is what first entered my kind. There is also Reverend's Bass contour control.